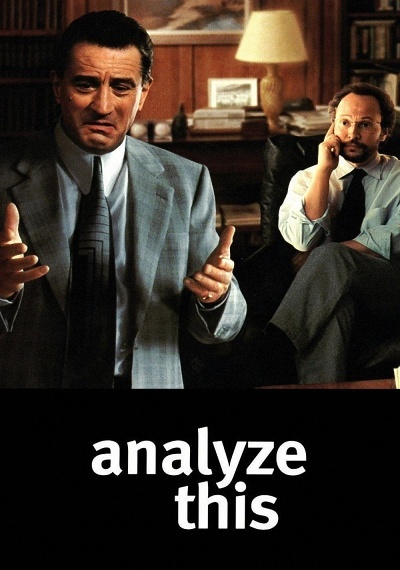 Analyze This :: Movie Information :: RabbitTV GO! "**** You'll laugh so hard you'll have to see it again to see what you missed!" - WPIX-TV. A frantic psychiatrist's life is turned upside down when he is forced to treat a domineering mob boss whose dirty secret is his fear of ordering a hit. Starring multiple Emmy-winner Billy Crystal ("City Slickers," "When Harry Met Sally...") and Oscar-winner Robert De Niro ("Ronin," "Raging Bull"). Co-starring Emmy-winner Lisa Kudrow ("Friends"), Oscar-nominee Chaz Palminteri ("Bullets Over Broadway") and Molly Shannon ("Saturday Night Live"). With a special appearance by crooner Tony Bennett. Fun-filled comedy from the director of "National Lampoon's Vacation" and "Caddyshack."